As far as morality goes, disgust has received a lot of attention, and there has been a lot of work on it. The flip side of it is cleanliness, or being tidy, proper, clean, pure, which has been considered the absence of disgust, or contamination. But there is actually more to being clean, and having things in order. On some level even cleanliness, or the desire to feel clean and pure has a social origin in the sense that primates show social grooming: Monkeys tend to get really close to each other, they pick insects off each other's fur, and it's not just useful in terms of keeping themselves clean, but it has an important social function in terms of bonding them together. 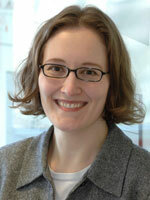 SIMONE SCHNALL is a social psychologist the Department of Social and Developmental Psychology at in Cambridge. Simone Schnall: I am a social psychologist, and study judgments and decisions from the perspective that emotions, and all kinds of feelings, including physical sensations, play a really important role. For example, such simple things as a sense of cleanliness can make a difference to how people decide whether something is right or wrong. We've been looking at, in general, how people make decisions, and how they arrive at judgments. In particular we've been studying moral judgments, that is, how do people tell right from wrong? It used to be thought for the longest time, going back for thousands of years of philosophical investigation, that people think of why a certain behavior might be wrong. They think of all the rational reasons, all the things they can come up with, they go through all the pros and cons, and then arrive at the judgment, and say, "Behavior X is either wrong, or very wrong, or not so wrong, it's fine", and so on. So it used to be thought that people think long and hard, and then figure out the answer. Now it turns out that actually this does not seem to be the case because first of all, people don't always think that much, and many thought processes are not really conscious, but rather, they happen outside of consciousness. Many thoughts just happen incidentally, and people aren't even aware of them. Therefore, instead of all these sophisticated thoughts and reasons, accidental factors enter the picture such as feelings and intuitions, for example, a sense of, "Well, I just have an intuition that this is the case", and such factors can be much more powerful than rational thought. For morality this idea first became popular in 2001 when Jonathan Haidt published his paper on the social intuitionist model, which has been a really influential idea. To give an example, if I ask you, "How wrong is it to falsify information on your CV in order to get a better job?" you might think that you just go through a rational process, and think of the reasons why this is wrong, or perhaps why it's not so bad. But we found that when you put people in certain emotional states, for example, if you have them sit at a table that happens to be very sticky, dirty, and disgusting, then people make different decisions. If you sit at a disgusting table, or let's say you're smelling a disgusting smell in the room, then you're more likely to say that falsifying your CV in order to get a better job is really wrong compared to somebody who sits at a clean table, or somebody who doesn't have a nasty smell around them. Similarly we find that when you give people a chance to feel very clean and pure, they decide that something like falsifying their CV is not so bad, it's proper behavior, or it's okay, it's clean. It seems like however people happen to be feeling at the moment colors their judgments about some even very fundamental decisions of whether it is right or wrong to do something. It's quite surprising that even though we like to think there are good reasons for our decisions, often times there are all these random things that just happen in our lives, and that's how we decide, for example, what is moral, and what is immoral. As far as morality goes, disgust has received a lot of attention, and there has been a lot of work on it. The flip side of it is cleanliness, or being tidy, proper, clean, pure, which has been considered the absence of disgust, or contamination. But there is actually more to being clean, and having things in order. On some level even cleanliness, or the desire to feel clean and pure has a social origin in the sense that primates show social grooming: Monkeys tend to get really close to each other, they pick insects off each other’s fur, and it's not just useful in terms of keeping themselves clean, but it has an important social function in terms of bonding them together. The same monkeys that pick bugs and dirt off each other’s skin actually end up getting closer in the process of literally getting closer, and they become buddies, or good friends. So it seems like this behavior of keeping each other clean, or having a desire to be clean has consequences regarding building social relationships, getting close to others, or letting somebody get close to you. There might be something really important about being clean, feeling clean, having things being proper and tidy that goes beyond just the absence of contamination or disgust. I've started my work on emotions and judgments when I collaborated with Jerry Clore and Jonathan Haidt at the University of Virginia. We got interested in moral judgment as an example of how emotions and feelings influence judgment and decision processes, and since then I've also done some work on positive moral emotions. We test, for example, the effect of what we call "moral elevations", which is the sense of feeling uplifted and inspired when seeing somebody else do something really positive for another person. The typical film clip we use is from the Oprah Winfrey Show where somebody comes on the show who has been a mentor to some disadvantaged kids who grow up in some really bad parts of town, and are probably headed for a life in gang culture, but he mentors them, and becomes like a father figure. We show participants this elevating clip, versus in other conditions we show them a neutral clip. Those who watch the Oprah clip report feeling really inspired, and uplifted, and elevated, and it gives them a warm and fuzzy feeling in the chest. But the important thing is not only this experience, but this feeling, in turn, leads them to help others as well. So if I have witnessed somebody who did something really wonderful, I, myself also feel like I want to be a good person, and also want to help others. After watching the Oprah clip, we set up the study such that participants think there is still a second part to come in the study, but then it looks like the computer crashes, nothing works, and they're told, "You're free to go even though you were meant to stay for an hour, you can go now" after just 10 or 15 minutes. They're about to pack up their things, and then we say, "Oh, but you know what? You could really help me out by filling out these questionnaires, they are some math problems, and they're really tedious and boring, but I need some people to fill them out, and whatever you want to complete would be really helpful." It turns out that people sit down again, and they start filling out these questionnaires, and what is really amazing is in the moral elevation condition, people would sit down on average for about 40 minutes and just sit and complete these boring questionnaires because they feel really motivated to help another person. The experimenter clearly needed help with the surveys, and they're really happy to help. That is compared to the control condition, where they also stay a little while, maybe 15 minutes or so, but in the elevation condition, people really went out of their way to help. We have found this now in various contexts, and it's a hopeful finding that these specific moral emotions can propel people to do good things for others. For example, if we think of how charities try to get us to contribute, they give us good arguments and reasons of how many children are starving in Africa, and the statistics, and all of that, and they try to appeal to reason. But from our finding, it looks like a more powerful way might appeal to emotion, to get people not just to think of, " These poor people who are suffering", but get them to think of how wonderful they might feel themselves when they can help, and how they might inspire others to also become the benefactor of somebody in need. Recently we also started looking at facial muscle activity in the context of morality, such as muscles involved in smiling or frowning. We used very sensitive electrodes to measure subtle muscle movement while people were considering certain moral transgressions, in other words, how much they smiled, frowned, and importantly, how much they pulled up their nose in disgust. We find specific patterns of muscle activity, for example, people literally frown upon certain behaviors that harm others, and they wrinkle their nose in disgust for behaviors that violate a sense of purity or cleanliness. But the important thing is that these muscle movements are predictive of people's subsequent judgment: If I frown upon you kicking a dog, the more I frown, the more wrong I will consider this transgression later on. Disgust is a very interesting emotion because it is more physical and basic than other emotions. Originally it evolved in relation to food. Anything that doesn't smell good might be potentially harmful to you, and if you ate some rotten or contaminated food, you might get sick. It's a very adaptive, very physical emotion. But then as time went on, so the theory goes, this very basic food-related emotion became more abstract in the sense that people also linked moral to physical disgust. Some immoral behavior might be considered disgusting, so there is a conflation between physical and spiritual or moral disgust: Disgust was initially the emotion that protects us from physical contamination, but then it became the emotion that protects us from spiritual or moral contamination; it protects us from bad things, bad behaviors, and bad people. For morality the immediate applied domain is the law, and Bobbie Spellman and I have speculated about possible implications. If you bring jurors into a courtroom and you make them wash their hands before they go in and then they get all the information about the court case, does that play a role? There are other studies in which physical manipulations change all sorts of judgments. For example, Lawrence Williams and John Bargh showed that if you hold a cup of coffee that's hot and subsequently judge a person, you may find that person to be more warm and friendly than if you are holding a cold cup of drink. So if you imagine a courtroom or any sort of legal situation, even if these effects are small, if you add up hand washing, holding the cup, and all kinds of factors that are, in a way, really subtle we find that they can influence behavior. Then you just wonder, "What does it do to these really important situations where people make decisions about who gets punished or who ends up in prison?" The question it all boils down to is whether feeling clean or dirty, or warm or cold at the moment, do these influences play an appropriate role or is it an influence that should be ruled out? Is it something that we should ignore is it something we actually should pay attention to? To what extent do we want to control for these feelings and get rid of them? Or rather, regulate them and say, "These must not play a role". To be honest, the whole idea that feelings play such a powerful role for morality is still quite new, and we are really doing the basic studies. We are doing the basic science of just looking at the really specific effects in the laboratory and we then have to take these effects out of the laboratory and apply them. At the end of the day, I suppose one goal could be to let people know that these are the effects that exist, and feelings play a role. So if you pay attention to where your decisions are coming from or what might be influencing them, you might be able to control some of these effects. Quite a bit is known about how feelings influence thoughts, and how to counteract this influence. One really influential approach by Jerry Clore and Norbert Schwarz is called the "Affect-as-Information" approach, which is the idea that whenever we have a feeling, whenever we sense a mood, or an emotion, we interpret it, and give it some meaning in terms of what it is relevant for. The classic study, for example, looked at how people decide whether they're satisfied with their lives, and it makes quite a bit of difference whether you ask somebody who happens to be feeling relatively happy at the moment versus somebody who is not feeling so happy — and that is actually reliably influenced by the weather. On sunny days people feel relatively happy, and they say life is great. On rainy days they say, "Well, you know, life is kind of miserable." But if you actually remind a person of the weather and say, "Oh, isn't it a lovely day? ", or "Oh, isn't it a lousy, rainy day? ", then people correct for that, and on a rainy day, for example, say that, "Well, you know, life is not so bad", because they realize that their feelings play a role as far as their judgments are concerned. So often times in life we feel something, and we interpret it as being meaningful. If I feel happy and good, I take that to mean that my life is good, even though, of course, how I feel at the moment is not really that relevant for life as a whole. This idea has been taken and found to be relevant in lots of domains, and most recently the domain that we've looked at is the moral domain, as I mentioned earlier. Often times we cannot help it, so even if we know that, " well, it's sunny, and that doesn't really mean that everything is good" or on the contrary, if it's a cloudy day, it doesn't mean that everything is awful, but it still feels like that. Feeling can be very hard to override, and that probably has to do with the fact that certain physiological processes in the body are very fundamental. We like to think that just by making an effort and exerting willpower we can override them, but these physical sensations can be really powerful and difficult to change. I'm not sure how fruitful it is to chase after consciousness simply because doing so might lead us astray. If a lot of what we do happens outside of consciousness or for reasons that we're not aware of, then if we try to figure out consciousness it may not explain that much. More productive ways forward might involve investigating the mind from the perspective of embodied cognition. It is the idea that a lot of thoughts or cognitive processes are not just to do with what happens in the brain, but they take into account physical sensations and information from the body, and the body in relation to performing specific actions the environment. It's all about the very basic cognitive processes that are in place because we are very similar to other non-human animals. It's as simple as that. We like to think of ourselves as special because we're so intelligent but we're still very similar to other creatures in terms of how we process the world around us. Larry Barsalou has done a lot of work to show that the language of the mind is very similar to how the body takes in information. The idea is that when we process something, when we have a sensory experience of some kind, that same type of language, or that same modality of information is taken and used in abstract thought processes. So this is where metaphors come in. Embodied metaphors are when, in a way, we take physical concepts from the world that we experience with the body, and use them when we talk about abstract things. For example, there is a recent empirical work to show that metaphors have an embodied spatial basis. We like to think of good things as up, and bad things as down. When we're feeling good we're standing tall, perked up, whereas if we're feeling bad, we might literally be depressed and down. Brian Meier and Michael Robinson, for example, find that when positive things are presented in an up location on a computer screen, people are faster to identify them than when they're presented in a down location. Similarly when something negative is presented in a down location it's easier to identify. So there is a sense that we have this spatial connotation of what is good and bad, and that seems to come from our physical orientation, simply how we stand, or how we function in physical space. It all goes back toMetaphors We Live By, by George Lakoff and Mark Johnson. It was all laid out there in the theoretical context of cognitive linguistics, but it was only recently that social psychologists started to empirically test these ideas, and there is now a lot of support for it. An interesting finding that has been popping up in the literature in various forms is the idea of some sort of moral equilibrium, such that people like to be at a minimal level of feeling morally good about themselves, and once they've reached that level, they're content to stay there. So just like embodied factors such as how clean or how disgusted I feel at the moment, how morally good I feel about myself can change my judgments and behaviors. The "the moral licensing effect" suggests that if I'm reminded that I'm a pretty good person, that I do good things, that I have positive qualities and so on, then I'm less likely to help another person than somebody who was not previously reminded of their positive qualities, and who has some self-doubts. Basically, once I've affirmed the fact that I'm a pretty decent person, then that's it, then I am perfectly content, whereas if I feel inferior on a moral level, then I want to help others, and do good things. It's quite powerful to think that people have this sense of a moral equilibrium that they want to reach, but then also not go beyond, or not drop below, and this may have really important implications for why people do good things, why they fail to do good things, why they do bad things, and so on. Again, it goes back to the idea that even though we think that rational considerations are behind our thoughts and actions, they might in fact be due to factors we’re not even aware of. Morality has really turned into a hot topic within the last few years in psychology. Somehow it really caught on. Why is it that this idea of an intuition-based morality has become so popular? I think there are a couple of reasons. One reason is that this approach links up well with the approach of embodied cognition, which has become influential at the same time. Another reason is because there is a growing understanding that so many things happen outside of consciousness. We are not aware of many of the things we're doing, and why we are doing them. So there is a lot of agreement that, often times, we do things for no good reason whatsoever. That means that for better or worse, rational thought may not really happen that often, and it's not such a central component of human life, or of why we do things.